In Shell Scripting we will use Variables to store some values. Variables are more useful when you have repeated values you would like to use in script multiple times. Instead of writing same values multiple times in shell script we can assign one variable value and call same variable in script multiple times. In this article we are going to see Shell Scripting Tutorial Variables Global Variables and Local Variables. Variable must be defined starting for the script, If not local variable. 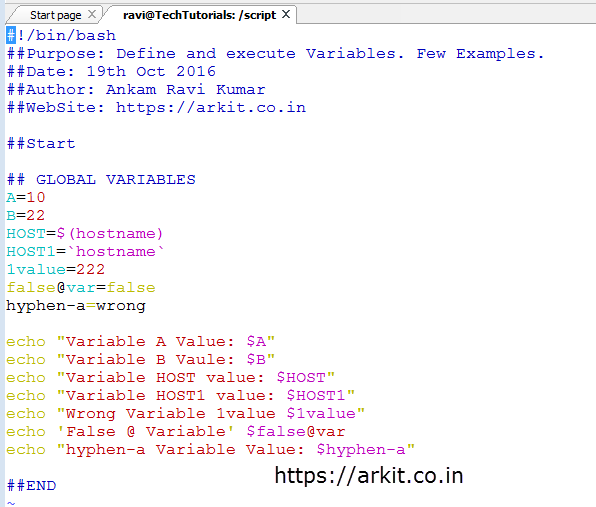 Below are few different types of variables defined as per above rules, Let’s see what happens when we execute below variable script. ##Purpose: Define and execute Variable. Few Examples. echo "Variable A Value: $A"
echo "Variable B Vaule: $B"
echo "Variable HOST value: $HOST"
echo "Variable HOST1 value: $HOST1"
echo "Wrong Variable 1value $1value"
echo "hyphen-a Variable Value: $hyphen-a"
If you can see above shell script executed, It is showing an errors where variable rules are not matching. Rule Says do to start variable with numbers, Do not use special symbols in variable and do not use hyphen -. So they are giving an errors. Whenever we are writing Variable we have to be careful if you write upper case and lower case each and every character will differ because it is case sensitive. NOTE: Best practice is to write shell script variable in UPPER case. Local Variable will work only within function or within condition statement only. If your calling local variable from outside of function or outside of statement it will not work. Let’s see the example here. 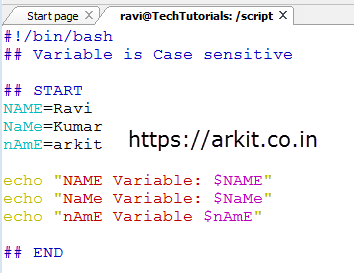 As per the above shell script code, i have defined one global variable called VAR1. Local Variable called VAR. Above script output does not printed variable VAR, because local variable can’t be called wherever we want.